If you are coming to Osaka, this tour is a great way to start. The areas you visit would be hard to navigate on your own and know what you were seeing. We had the best guide ever, Kaori. She points out things for you to see after the tour and helps you master the subway. This tour would be great if you only had one day in Osaka, too. I had 1 day to see Osaka and this tour was great in pointing out the tourist and shopping sites in Osaka. I would not have been able to find all these areas on my own. My tour guide , Kaori, was great in telling me the history behind the items on the tour. Having an enthusiastic tour guide makes the entire experience better. With the knowledge I gained on this tour, I was able to plan out my remaining afternoon self touring trip of Osaka. Ichiro was an awesome tour guide! I loved his humor and his knowledge of Osaka was impressive.I learned a lot! If there is anything i'd change it would be to make the tour a little longer and include lunch instead of snack. So two hours, lunch and maybe another hour and a half. Ichiro was a wonderful guide. As it happened only my hubby and I turned up for the tour so we sort of had a personalised tour with Ichiro as our knowledgeable guide. 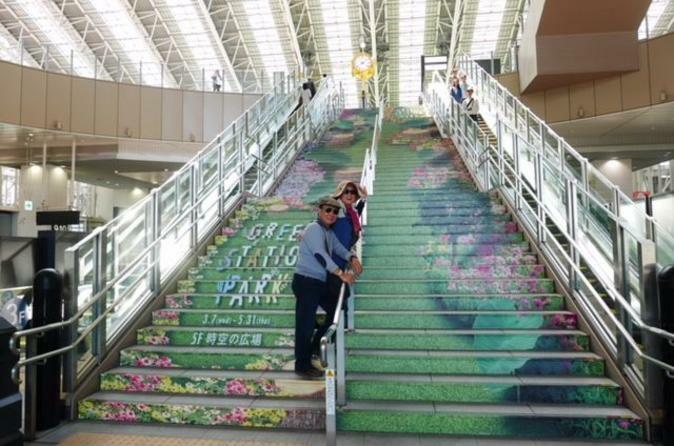 He toured us around the premises of Osaka City Station and brought us to levels of the building which we would not have explored if we did it alone. The Green Station Park had an interesting story to it including the 2 clocks seperately depicting the cultural and financial face of Osaka. 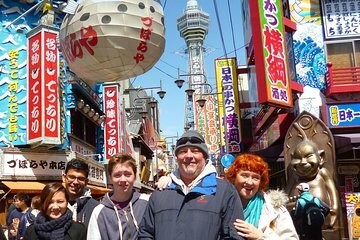 This tour is ideal for first time visitors with limited time as Ichiro brought us to interesting places to get insight of the must see sights if one had time to go back to. Highlights were the trips to the knife factory, the restaurant row where we ended up having our shabushabu dinner of Matsusaka at Gyu-nabe. Excellent service and we even got to meet the Manager who was a mate of our guide. We also enjoyed our Dotonbori shopping moment. I will certainly refer Ichiro to my relos and mates who wish to take this 3 our tour. Highly recommend and very informative. My tour guide Yasutomo was brilliant! Very polite, knowledgeable with a good sense of humour. Overall a very informative half a day tour. Really enjoyed it! Excellent tour with Aki and Keiko. We got to see a cross-section of Osaka that we would never have known about without our helpful guides. Highlights include the view from the top of Osaka Station, the water clock , old Osaka streets and eating a 'snack' in this area. A good way of orientating oneself around this part of Osaka. Mr Jing Zhi was very knowledgeable and friendly during the tour. There was only 3 of us in the tour so it was private and cozy. We get to learn new knowledge and walk to places that we would never have gone without the tour guide. Thank you! This was an enjpyable tour, seeing areas of Osaka we probably would not have visited on our own. guide was very good and we got to sample regional Osaka specialty food. Felt this was very good value and highly recommend. Top notch and highly informative, the guide was very knowledgeable and provided terrific information. A very worthwhile tour!